But this time, i found a good way to cook salmon fillets which is rich in taste as well as i wanted the flesh part to remain juicy as well, and so i tried making it with a continental way, believe me it turned out so well and my BF just loved it. I added some ground pistachios as well, which added a unique taste and healthy wise, this way of making worked out well. The making is not tedious and all the ingredients are easily available in most super markets and you could make this in minutes. Here you go with the making..
Marinate the salmon fillets with all the above ingredients except egg and maida and keep aside for half an hour. After half an hour add eggs and dust the salmon fillet in the maida. Shallow fry in the butter after it melts completely and becomes hot,flipping both the sides and transfer to a paper towel. In a saucepan, add 4 tspn of butter,when it starts melting squeeze half lemon to it before the color started changing remove from fire, add fresh parsley to it and keep aside. "Adding dressing is very much optional however if you want to try, you could use caesar salad or mustard sauce. You can use any kind of oil for the shallow fry of your optional. Adjust pepper powder according to your spice level." Naatu kozhi kulambu is an all time favorite for most chicken lovers especially if you are from the south part of India. Its a spicy curry blended with all natural spices and coconut. The typical naatu kozhi kulambu normally doesn't comprises coconut, however i wanted the curry to be more thick and hence used it.The best combo while you make this village style chicken curry would be idly/dosa than having it with rice and thats the option for me and my bf too. 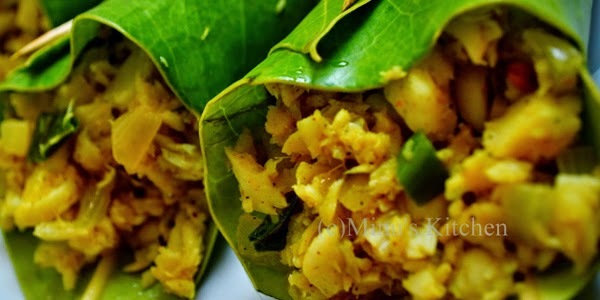 This is a recipe which has a different taste as it has tamarind as well, however its optional if you don't want to add. Grind the ingredients under “To grind” and keep aside. Add the sliced shallots and saute until turns translucent. Add all the rest of 1/2 tspn of powders,saute for 2 minutes until the masala smell goes from it. Add the marinated chicken pieces and sauté well ,until the chicken is well mixed with the masala powders. Pour the tamarind pulp and mix well, and cook it covered until the chicken is cooked well. After the chicken is cooked completely add the coconut paste and mix well. "You could replace the poppy seeds with some dry cashews dipped in water if you dont want to use the poppy seeds. As this is village style chicken its better to use the sesame oil however its optional, and if you want to change you could make it with other oil of your choice. Adjust the spice powder as per your spice level. Adding tamarind is optional however it gives a better taste." 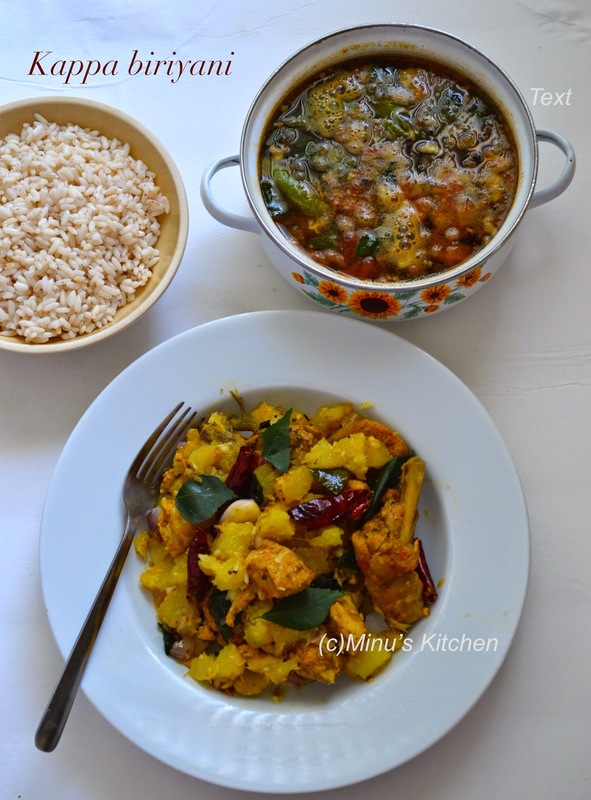 If you are a fond of foods from thatukada/ street shops in kerala,then you may know how tasty this recipe could be. Its a unique recipe, as its a spicy combination of meat and kappa / tapioca. 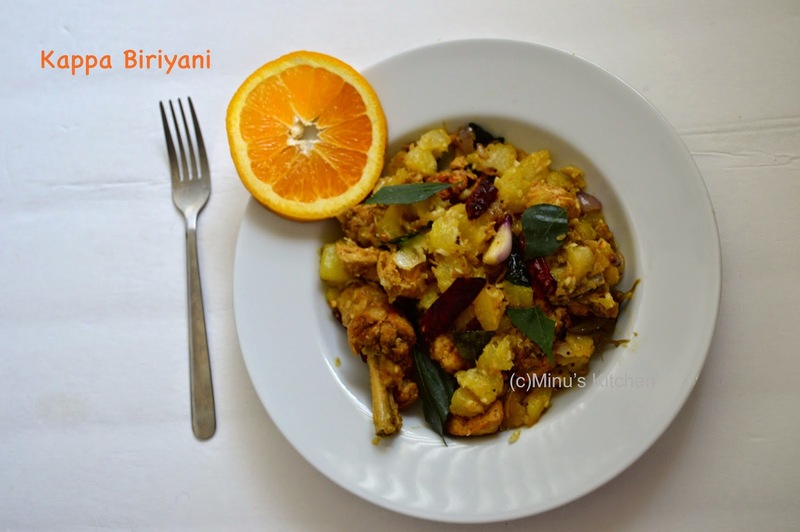 For people who is new to this recipe, you may get confused of the name, as its named as biriyani but it doesn't comprises any rice in it. Its known as different names in different parts of kerala. 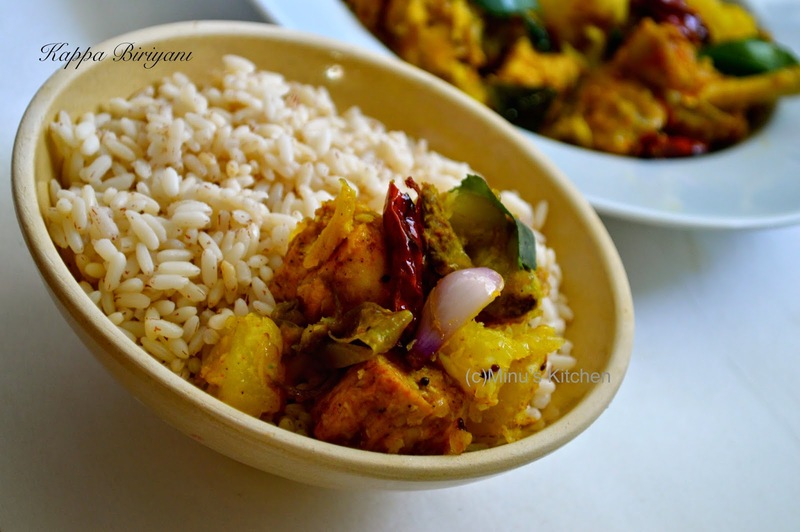 But as a whole kappa biriyani is a very famous recipe often served in most restaurants in God’s own country. Add water to the cleaned kappa and pressure cooker it for 2 whistles or cook the kappa in the water until its completely cooked in a open vessel. After the kappa is fully cooked, drain the excess water and keep aside. Coarsely grind all the ingredients under “to cook kappa” and add this to the drained kappa and mash it well with a laddle. Keep aside once everything is combined well. Marinate the meat with all the powders(adding 1 tspn of everything) under “to cook meat” along with the curry leaves and keep it for 1/2 hour. Pressure cook it for 2 whistles or until the marinated meat adding adequate water is cooked well. Keep aside the cooked meat. Now, in a separate pan, pour coconut oil, add small onions and green chilies and saute well until it becomes translucent, add all the rest 1 tspn of powders under “to cook meat” and saute well until the masala smell goes off from it. Add the pressure cooked meat to this and sauté well until the water evaporates from it. Now, add the cooked meat to the prepared kappa and combine well with a laddle. In a separate pan, pour oil and add all the items under “to temper” and add the seasoning to the combined kappa. "When you cook kappa, make sure it shouldn't be so watery or hard, it should be in the consistency where when you break it it should be soft to do that. Adjust the spice powders as per your spice level. You can make it with any meat of your choice either chicken or beef, i made with chicken." I want to give a best recipe as aim posting in my blog, after a long time, and was thinking what could be the best to give my readers, i decided something which is tasty and simple to make as well, and then i ended up making a fish puttu you may also call it as a “Meen Podimas”.I never tried it before but thought to give out a try as my bf is a big fan of it. You could make the same recipe with the crab as well, and that will taste good as well, but may find a little hard time, for breaking the crab shells and removing the meat from it, and so i made it with fish. Clean the fish fillets with water and steam the fish pieces ( i used idly cooker for it).After its fully cooked keep it aside.Let it cool. When you are able to handle the steamed fish, shred it by hand and keep aside. In a separate pan, add oil, when it becomes hot add the mustard seeds,cumin seeds and curry leaves and after a minute add the chopped onion,green chilies, crushed ginger and garlic pieces and sauté well until everything combines well. Add all the powders listed in the ingredients with salt and sauté well until the masala smell goes from it. Now add the shredded steamed fish to this and give out a stir and combine everything well. "You could replace the fish with the crab as well. However the process remains the same. Adjust the spice powder as per your spice level, if you need more spicy you could use chili powder as i used the pepper powder instead as i don't want to change the color of the recipe. Steaming the fish is good than boiling the fish in the water, as steaming gives better taste than boiling it separate. Onions and other ingredients should be chopped finely to get a fine texture of the putt." I know its been a very long time I posted something, I was bugged up with lots of things still, I would manage to post but not regularly, I request my readers to kindly bare with that and provide your incredible support as always. Though I haven't posted anything for a while, everyday my readers count was high and stable, I thank you for that and this encourages me to develop my blog even in my busy schedule.This time I came with a recipe which is famous with most of the non vegetarians, I personally love this recipe and my hubby too. Its been a very long time I had the anchovies fry, as I had hard time in finding it in seafood shops. The cleaning is very simple but its a little more than the usual time for cleaning the fish, because of its size and the quantity you buy, just peel off the head and then make a slit with a knife near its neck and pull out all its intestine parts and its done. After its all peeled make sure you wash with rock salt(kalluppu) to remove any mud in it. You could make this with either frozen or the fresh fish, but my first choice would be the fresh ones.You are all set to make it and its very simple to make too. Here you go with the ingredients. Marinate the fish with all the ingredients except oil and keep it for at least 40 minutes. 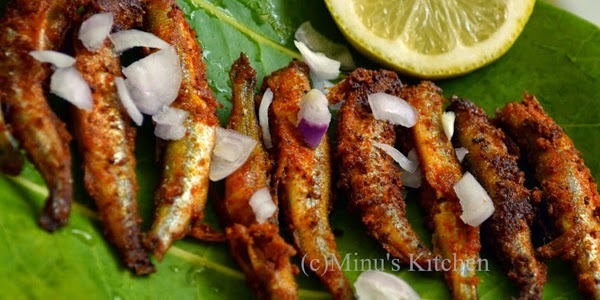 In a pan, pour little oil(just for shallow fry), arrange all the anchovies and fry it flipping it both the sides. "If you want to make the fish more crispy then allow the fish to fry for more time in the oil. Adjust the chili powder as per your spice level. Adding herbs is optional however it gives a good aroma to the recipe. Adding curry leaves will give extra taste for the recipe. Frying it in coconut oil is your choice however, it would be the best for this recipe." Unless the Hyderabadi Dum Biriyani. Bezawada biriyani is easy to make and doesn't need a lengthy marination for chicken. This biriyani is very famous in most of the Andhra non vegetarian restaurants. All you need to do is slice the chicken into small pieces i would prefer you to use the thigh or a breast part of the chicken.You can get it separately from super markets, you could use the fresh or a frozen piece. 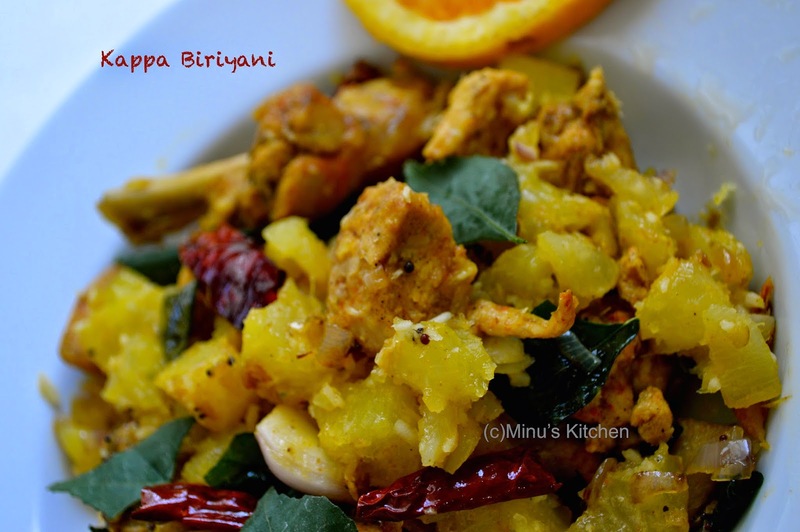 As this is a fried chicken biriyani, you gonna fry the chicken pieces first and then prepare the masala. The assembling is much similar how you did for the hyderbadi Dum Biriyani. Soak the saffron in the milk and keep aside. In a separate pan mix the chicken pieces with all the ingredients under “for marinating chicken” and keep for half an hour, after half an hour deep fry the chicken and keep aside. In a pan, pour water, when it starts boiling add the spices listed under “to cook rice” and salt. Add the basmati rice and cook for a while. The rice should not be fully boiled. It should be 70% done. So, when you press it, it should be little hard and that’s the correct texture else getting the right biriyani is difficult. After its half cooked, drain the rice and keep aside. Now in a separate pan, add the ghee and saute the onion until it becomes soft, now add the tomato and green chilies,ginger garlic paste and saute again until the masala smell goes from it. Add the 1/2 tspn of curd and saute again, add the coriander,mint leaves and now add the fried chicken to it and give a stir.Switch off the stove. Please refer the Hyderabadi Dum Biriyani as its the same process. In the heavy bottomed pan, pour ghee at the bottom and spread it evenly, now, add the cooked masala chicken. On top of it, add the drained rice and top it again with crispy fried onions and again top it with rice. Overall the chicken should be at the bottom and the rice and onions should be on the top. After all the rice is layered pour the soaked saffron milk and on top of it, add the rose water it gives a good flavor. Close the pan tightly and make a maida dough, now, close the pan with the lid and press the maida dough around the lid to make it tight. Now, keep the pan in the stove in high flame for about 5 minutes and change it to low flame and cook in low flame for about 15 minutes. After the set time, let it stand for about 5 minutes. Serve hot with raita. "You can add the orange color mixed in water instead of using the milk soaked with saffron. Adding rose water is optional however if you use, it gives an extra flavor to the recipe. Adjust your spice level as per your need. Avoid using excess turmeric powder as it may change the color of the biriyani"
I was thinking to post this recipe from a very long time. 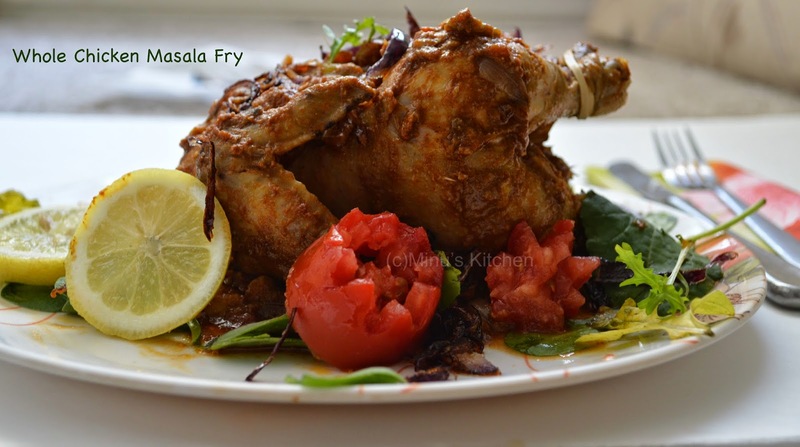 This is one of the best and unique chicken as its cooked as whole with all the masala. When I got the recipe from my Amma I wasn't very sure if I get as tasty as my Amma does because I was much confused if it will get cooked well in the center of the chicken,however I just followed the exact instruction from her and I was very much surprised that it was very similar like hers. She does it just like in short time and its one of my favorite from her cookbook. My Bf tasted it for the first time and he became a fan too :) I made this with the Cornish hen which is available in most supermarkets ( if its frozen you may have to put it in the hot water until it becomes smooth). As I made with the cornish I didn't attempted to clean anything inside the chicken. 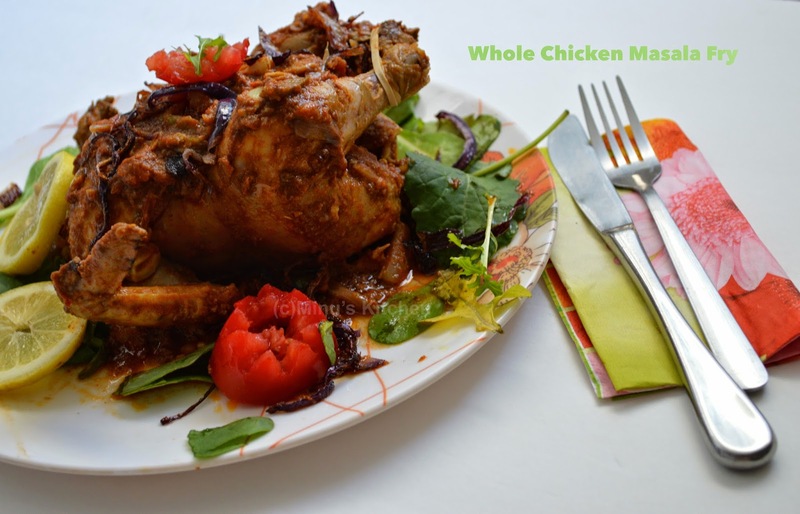 Marinate the whole chicken with the ingredients under “to marinate” and keep aside for at least 1 hour. Deep fry 1 large onion chopped until it turns crispy in ghee and keep it aside. In a big thick bottomed vessel,pour oil and add the other 1 onion sliced,tomatoes,green chillies and crushed garlic and ginger and sauté well until it combines well. Add garam masala and add the marinated chicken and give a light stir for the masala to get into the chicken. Add hot water (a little) into the sides of the chicken and give a smooth stir. Close the vessel with the lid and cook it covered for 3 minutes. Reduce the flame to low and again flip the chicken and add the coconut milk (a little) and give a stir and again cook it covered for 5 minutes. At this stage the chicken must have cooked as 3/4th stage.Now repeat adding the hot water and coconut milk and flipping up and down the chicken until the chicken is fully cooked. After you are done with adding the entire hot water and coconut milk, do not cook it covered, just cook it uncovered for the gravy to become thick. You will now see the gravy thickened and the best way to check if the chicken is cooked would be pricking it with the fork and if goes smooth into it then it means you are done. At this point, in a separate pan, add oil and soya sauce and saute for a minute. Add this sauce to the cooked chicken( add it on the top) and few curry leaves and coriander leaves. Give a quick stir at the end. Assemble the chicken, by keeping some masala as the base for the chicken in the plate and on top of it,keep the chicken and then pour the remaining masala on top of it.Serve as whole to rice or chappathi. "Since we are cooking the chicken along with the gravy, always keep the flame as low so that it will not burn at the bottom. At first when you begin, you will find it hard, and confused as the chicken gets separated from the masala but once the curry gets thickening pour the curries from the sides and pour it to the top of the chicken at regular intervals so that the chicken will observe the masala. Handle the chicken with care while flipping it, as there may be chances for the wings or legs to break.Hence use essential utensils ( I used 2 large spoons for flipping the chicken). Do not add the coconut milk and hot water as a whole in one time, add it in regular intervals it is a must, as the chicken gets cooked by doing that way." All the content in the blog are copyright registered- © Minu's Kitchen.. Powered by Blogger.